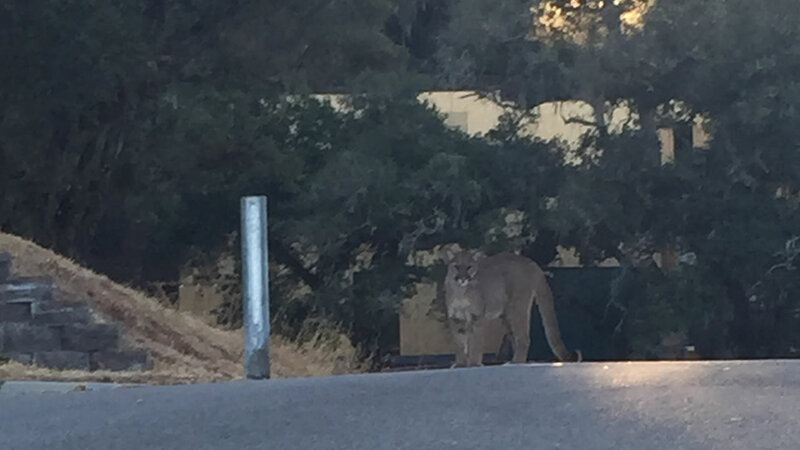 A mountain lion was observed by a citizen who was walking a dog in the area of Tea Tree Way and Mimosa Court in GIlroy, Calif. on July 16, 2015. GILROY, Calif. -- Police are notifying the public of three recent mountain lion sightings in the Gilroy area. The first sighting occurred on Monday in a wooded area at the rear of a residence in the 9200 block of Mahogany Court. The second sighting occurred in the same area on Wednesday, police said. The third sighting occurred Thursday in the area of Tea Tree Way and Mimosa Court. In that sighting, a citizen was walking his dog when the mountain lion jumped down from a tree and stood about five feet away. The mountain lion then briefly followed the man as he slowly walked away. The mountain lion eventually retreated into the woods. The citizen was able to take a picture of the mountain lion, which is described as an adult or adolescent. Gilroy police responded to the sighting to alert people in the area and to search for the mountain lion, but it was never located. The Department of Fish and Wildlife was notified of the sightings and will be working with police to help ensure the public's safety, police said. The police department is reminding the community the area is in close proximity to a mountain lion habitat. Residents are being advised to hike in groups, adults are reminded to supervise their children and keep them close. Also, never approach a mountain lion. If someone comes into contact with a mountain lion, they are advised to appear larger by raising and waving their arms, not to run and to give the animal a path of escape. People are also advised to throw stones, sticks or branches to scare the mountain lion away, speak in a firm voice and fight back if attacked.